With Cognizant, which has so far defied the trend of moderate growth in information technology (IT) services sector, projecting lower growth in calendar year (CY) 2016, export-dependant Indian companies have a major reason to worry. The Nasdaq-listed IT services company on Monday said it expects revenue to grow at 9.9–14.3 per cent, one of its lowest ever, and cautioned about spending cuts by the clients in financial services and healthcare sectors. It has come as a surprise for many that Cognizant, which was known for best growth among its peers, has given outlook whose lower end trails the overall industry guidance issued by Nasscom. For CY16, Nasscom expects IT services to grow between 10-12 per cent, lower than the previous year. “I think Cognizant’s issues lie in a few areas. First is the rapidly maturing industry in which growth rates are dropping for all firms. This is a secular trend that until now Cognizant has managed to defy, however, it now seems to be catching up to them as well,” said Peter Bendor-Samuel, founder and chief executive of Everest Group, a consulting and research firm. 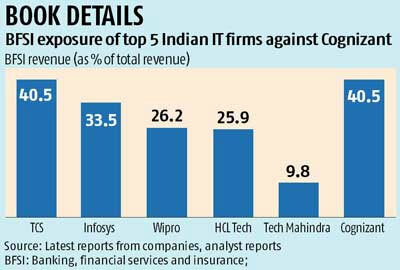 All major Indian IT players including Tata Consultancy Services (TCS) and Infosys are overly dependent on banking, financial services and insurance (BFSI) segment, which accounts for around 40 per cent of their total revenues. However, in healthcare, Cognizant is ahead of most Indian peers which perceive the sector as the next big opportunity. Cognizant has been bolstering its presence in health care segment with big acquisitions like Trizetto. “We are seeing a lot of softness in the banking (BFSI) side, and I would imagine that many of our peers would also be seeing that. Because of the broader economic environment, we are seeing some slowdown in terms of discretionary spend,” Rajeev Mehta, CEO for IT services at Cognizant told Business Standard. “Clearly, the industry is in a maturing stage with growth slowing and pricing pressures increasing… If Cognizant with its superb sales and account management capabilities shows signs of slowing growth, it suggests that the rest of the Industry is also likely experiencing similar issues,” added Bendor-Samuel. In CY15, Cognizant delivered robust growth both in terms of revenue and profit. At the beginning of the last calendar year, Cognizant had started with a revenue growth guidance of 19 per cent which it revised thrice before settling for 21 per cent. In CY14 also, the company raised its rather moderate revenue growth outlook couple of times to finally post a growth of 16.1 per cent. This indicates that the “glass is rather half full than half empty” for Cognizant, said Tom Reuner, managing director for IT outsourcing research at HfS Research. “Reading and interpreting the comments on earnings results feels like an esoteric form of art at times. Cognizant’s business model and execution have been the envy of many of its peers - it doesn’t come unstuck just overnight,” said Reuner. “The cautious guidance on Q1 CY16 is in all likelihood caused by an intricate interplay of macro-economic headwinds, consolidation in the US healthcare market and account-specific issues. While the issues around the Health Net contract are well documented, it is more difficult to pinpoint to challenges in financial services,” he added. Indian IT outsourcing industry is still not completely out of the difficult phase that started with the global economic slowdown in 2008, resulting in project cancellations, cut in spending by clients and employee lay-offs. The management commentaries of top Indian IT services companies like TCS and Infosys in the just-ended quarter have also not been very positive even though they looks more promising under the new management after showing strong performance in the last few quarters. IT stocks have reacted quite sharply to Cognizant’s poor outlook. The BSE IT index was down about 3.5 per cent and the share prices of most large companies were down more than three per cent. Wipro was that only exception which lost just 1.72 per cent at the end of trading on February 9.